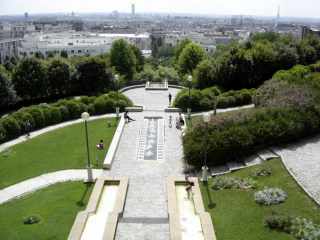 Parc de Belleville: During the 14th century, the hill of the Belleville neighborhood was the royal domain of the Merovingians. The name "Belleville" is first mentioned by the Bishop of Paris in October, 1543. The area had been known as "Savise" until the 13th century and then known as "Pointronville" until the 16th century. Up until the 18th century the area was cultivated fields, wind-mills and taverns. The district had been famous for its taverns since the 14th century. 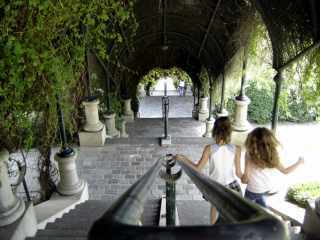 In the 18th century, an important gypsum quarry was developed where the Parc de Belleville is now. Parisians who were displaced from the center of Paris with the razing of residences, buildings and streets by Baron Haussmann during the late 1800s re-settled in the Belleville area. Belleville has recently become the home of immigrants from Poland, Armenia, Turkey, Yugoslavia, Algeria, Tunisia, and the French West Indies. Belleville was also the home-town of singer Edith Piaf. In the mid-18th century, at the "Au Tambour Royal" one of the taverns that gave the area its reputation for being a drinking area, the celebrated café owner, Ramponeau, served an inexpensive wine called "Piquette" made from the grapes grown in the Belleville vineyards. Ramponeau is now the name of a street and a restaurant in Belleville. The wine called "Piquette" had been maligned as a bad wine. However, it has been defended as having been a young wine and lightly effervescent. 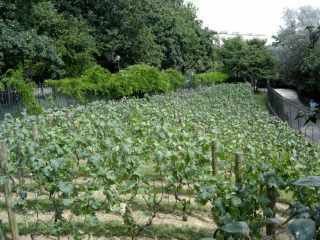 Parc de Belleville has a small vineyard growing pinot meunier from Champagne and chardonnay from Bourgogne. This vineyard is a reminder of the viticultural history of the area. 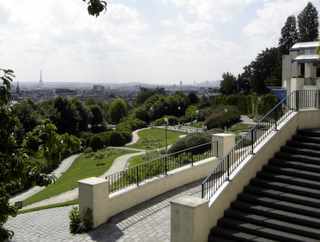 The Parc de Belleville covers 45,000 square meters. It was designed by François Debulois and opened to the public in December, 1988. 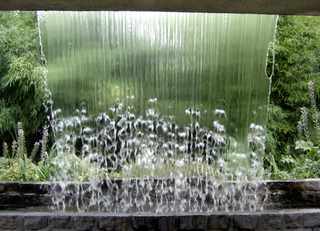 The elevation of the park is the highest park in the city and also boasts the longest cascading water fountain in Paris, 100 meters long. The park has hundreds of trees, mostly lindens, sophoras and catalpas as well as 30 other species including dogwood, mock-orange and lime trees. The Park offers one of the finest panoramic views of the city. It has an open air theatre and there is over 1,000 square meters of lawn area here. 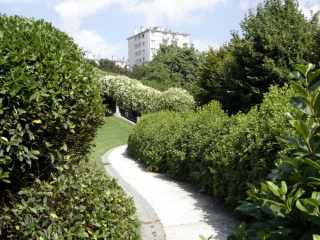 The park is situated on the slope of the hill and has a series of zig-zagging walkways, or "switch-backs" to use a hiking term, weaving through open lawns, groves of trees, flower and shrub gardens. 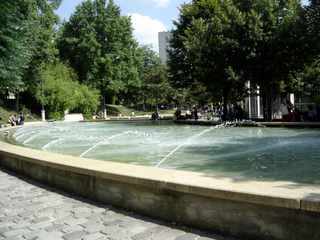 At the low end of the park are shallow pools of water which are a favorite cooling-off area. 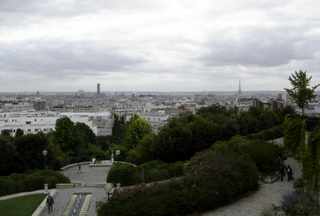 Parc de Belleville opens at 8 a.m. during the week and at 9 a.m. on week-ends. In January it closes at 5:30 p.m., in February at 6:00 p.m.; in March at 7:00 p.m.; from Arpir 15-May 15 at 9 p.m.; from May 16-August 31 at 9:30 p.m., in September at 8:30 p.m.; in October at 8:00 p.m., November 1-November15 at 6:00 p.m.; November 16-December 31 at 5:30 p.m. The Park is also the home of the Maison de l'Air. The Maison de l'Air, the House of Air, offers information and exhibits concerning the air and atmosphere of Paris and its connection to the inhabitants regarding quality of air, pollution and its sources. It also examines the air surrounding Earth, weather, how air transmits sound and odors, how plants germinate by using air, how birds, insects and bats use the air and their mechanics of flying and the history and the evolution of air. The Maison de l'Air is open during October-March from 1:30 p.m.-5:30 p.m. during the week and on Sunday; during April-September it closes at 6:30 p.m. on Sunday; during November-February it closes at 5 p.m. It is closed on Monday and Saturday. Admission prices are 2 euros for adults and 1 euro for ages 7-25 and free for those under 7 years old.